I wanted to put together a couple of posts sharing the things we are doing to prepare for the new school year. First, I shared how we are getting back into a new sleep routine and today, I thought I would touch on school lunches! We do our best to pack the kid's their lunches since it's such a huge money saver. Once a week, we allow them to snag up a lunch from school, since it's a special treat. We have them look at the school menu ahead of time, pick a day to eat school lunch, and the rest are packed by the hubs and I. This year I would love to be really organized when it comes to packing up lunches. I am using the power of inspiration found on the www to do this. 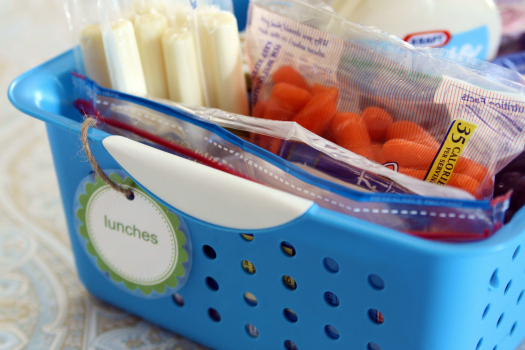 First, these snack baskets which I first saw on ohdeedoh, are such a great idea! And we already have been doing the same thing with dry snacks for quite some time. But I wanted to borrow from the idea and use it to create a lunch making station in the fridge. 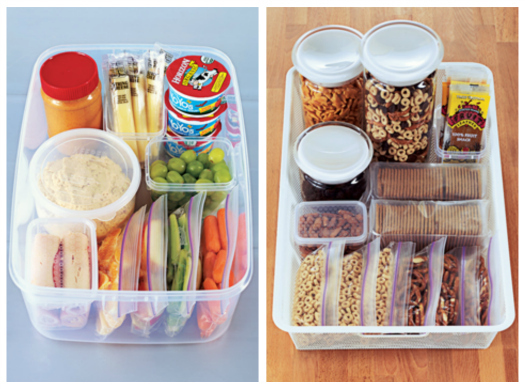 Something we could just easily grab that has all the things we use each time we make up lunches. So I just took a cheapo plastic basket that we already had, added a quick laminated label, and filled it with all sorts of lunch making goodies! 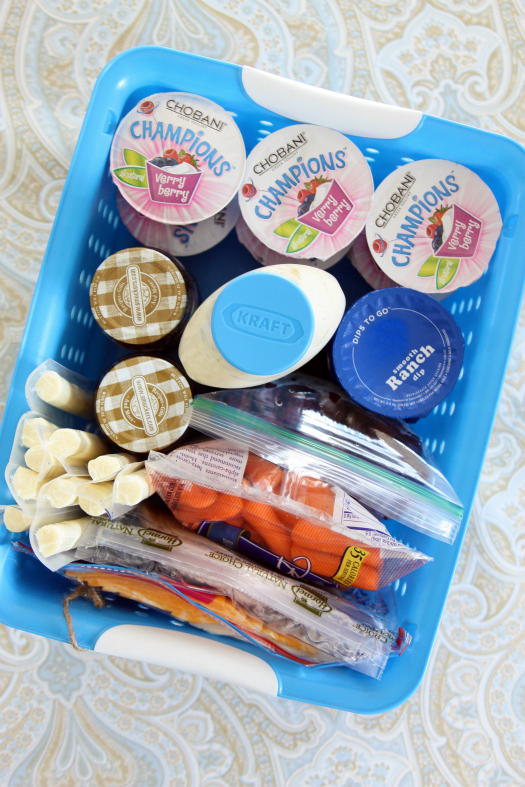 This one basket holds cheese slices, lunch meat, cheese sticks, grapes, carrots, jelly, mayo, yogurt and ranch cups! And tucks perfectly on a shelf in the fridge! I am hoping that having all of their items in one easy to find place, it will make lunch making an easy breezy process! I picked up a four pack from Amazon , and love them so much I might just snag up a second set so we always have some clean. They are really durable, I love that I won't need to waste plastic baggies and the best part is that it keeps all of their food separated, yet in one container! What other lunch making tips do you have? 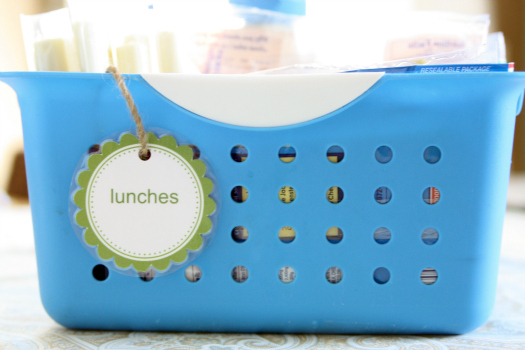 How do you keep lunches interesting for the kids throughout the year? 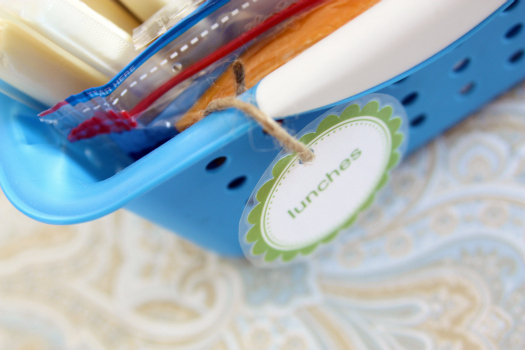 How about ways to make the lunch making process easy peasy? Has anyone else had a lunch station in their fridge that has worked, or do I dare say it, hasn't? When I was in grade school (I just turned 40 this year), my mom was making sandwiches ahead of time and freezing them. She also saved money by baking and freezing brownies, cupcakes, etc. Each morning, we would take a baggie (with a twist tie) of chips or pretzels, a piece of fresh fruit, a frozen sandwich and a dessert and put it in our lunch box before school. I also remember film canisters with milk money! Thanks for the memory! My mom used to do the frozen sandwiches bit. I have to say, it was dreadful. I ate half frozen bologna sandwiches for years...until such time as I was SO sick of them I simply stopped eating lunch all-together. Might work for some but vary it, please! I'm a mom of four and a teacher...the love notes are such a sweet idea. My only suggestion is that you wait until they can read to send them. From a teachers perspective it is hard to get all of their packages (goldfish snacks ect.) open and walk around and read 25 little love notes in a lunch period. :) Just a thought!! I do the same thing with my first grader. Until she could read, I would draw pictures. Now, I LITERALLY spend one night a month to make little notes that I print. On the notes I include the following... date, what happened today in history or an interesting fact, a joke, and a place for a personal note from me. Now, why do I put all this? My daughter was being "bullied" about her lunches. Certain students would tease her about why she brought "ol d lady foods in her lunch." (As silly as it sounds, it became embarrassing for my daughter to bring the foods she enjoyed most- salads, baked potatoes, homemade soups, etc.) I began putting the jokes and factoids on notes so she would have something interesting to tell the kids or jokes to break the ice. Now... the other kids could care less about the "gross" food in her lunch, but focus more on the "joke of the day" or the new cool fact she can tell them. Thus far, I have not had any trouble finding "new material." Guess I will cross that bridge when I get there. In closing, not only is the note providing entertainment to her and classmates, but, its also educational. What an intelligent way to handle your daughter's difficulty! I love that you took it upon yourself to find a positive way to turn around the situation. I would have just whined to her teacher, which is now a very embarrassing thought! Oh, and check out the Vegan Lunchbox and be amazed at the lunches she packed for her son. I used Easy Lunch Boxes last year (I had a 2nd grader). They are the best option I have found for ease of use and convenient. My only complaint is that after a few rounds in the dishwasher the tops don't fit quite as well. I have taken to hand washing them, which is kind of a pain. The bags are also kind of bulky, so make sure the child's backpack can fit them, my kids don't like to carry their's separately since they walk to school. I'll have two kids in full day school this year and one at home. My plan is to have everyones lunch (husband, me, school kids & toddler) made in the morning. 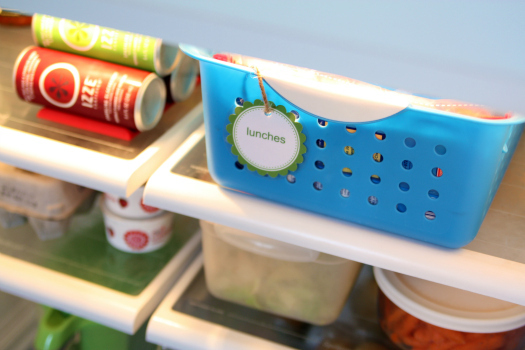 I will definitely create a lunch basket in our refrigerator, that is a great idea! My other goal is to have peanut free lunches, the school hasn't sent home an rules about peanut free lunches but I know a few kids do have peanut allergies and I want to be sensitive to them. I am always looking for more lunch ideas and have a Pinterest board dedicated to school lunch ideas and so I can't wait to see what you find too (I am following you). Just wanted to say...thanks for being sensitive to food allergies! As a mom of a boy with several severe food allergies, it warms my heart to know there are those who are sensitive and willing to adjust for the safety of another kiddo. Thanks!!! I have those containers...I got mine super cheap at Big Lots! kurlypink - is there anything about laptop lunches that you don't like? It was a very close decision for me between them and Easy Lunch Boxes. Melissa at www.anotherlunch.com has really cute bento style lunch ideas and, at least last time I checked, she had cute printables for little notes. I have had laptop lunches for several years now. I love them!!! The thing I love best is that the containers are separate, so if there is something that needs to be heated up, you can with no problem. My youngest is a Senior in high school this year, so I've been packing them for awhile now! My best advice is make them the night before...things that don't need to be kept in the frig can go right into their lunch boxes, and those needing to stay cool on a designated shelf in the frig. I also found a simple formula works well-main dish (sandwich, salad, yogurt, wrap, etc), veggie, fruit, salty sweet. 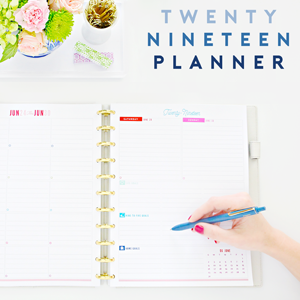 You can make up a list ahead of time of ideas for each section. This has worked really well for our family for many years. My three-year-old will be starting a preschool this fall, and we have to prepare his lunches, so this post couldn't come at a better time! If you ever find any other lunch tips/ideas, please post them!! On an unrelated, what is that thing in your refrigerator that organizes your Izze's?? i am a mom of a 3-year old and one tip i have is to use a cookie cutter (or sandwich cutter) for his/her sandwich. i use the same heart-shape one over and over again, but it makes the sandwich the perfect size for his little hands. he loves choosing a shape for his sandwich. If you end up needing any extra lunch packables that keep items cold, I am LOVING these Aladdin containers that house a little snap-on ice pack at the top. They were $4 at Target, and they come in both snack and sandwich size. I had trouble finding photos online, but you can see them in my first photo in this blog post: http://mamadoitall.blogspot.com/2011/08/anatomy-of-lunch-box.html - anyhow, the inserts work great both in the boxes and alone, and the containers have held up really well in the dishwasher. Great for fruit or deli meat sandwiches that don't do well unrefrigerated. :-) Thought I would share! Thanks Jen! I'm going to buy those lunch containers ASAP! I go through so many plastic sacks!!! I am in love with this post! 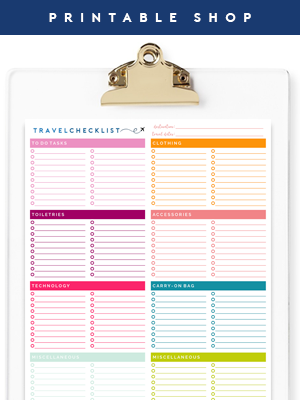 Such great ideas I need to adopt to make my life easier and more organized. Great post! I don't even have kids and those lunch containers look like a must-have. My husband and I go through so many plastic bags packing lunch for work, they seem like the perfect solution! You should totally get the boys Bento Boxes or Laptop Lunches one year for the holidays or their birthdays! so fun and colorful and they have little customizable and removable compartments! I plan on getting those for my future kiddos! Oh my goodness, thanks so much for this post! Even with little ones not yet in school, those snack/lunch pics are so inspiring!! Great post! Funny I posted those same photos from Real Simple this week. Packing lunch is a biggie at our place with a food allergic child. I hope you come check out my posts I lovingly named "Packed With Love". 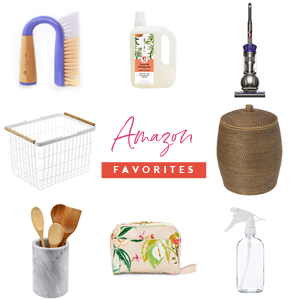 Thanks for the suggestions! I just ordered two of the totes and a set of the containers! I am excited and hope this will make lunches easier to prepare. My DD isn't old enough yet for lunch boxes, but I'm already planning on doing the bento thing. I try to do that with his lunch on his plate that has separate compartments. We try to eat Vegan as much as possible so I love the book Vegan Lunchbox. Lots of great ideas. Mini bananas are so cute, and such a perfect size for little lunches. Love all your ideas! I am especially in love with this idea. My husband always throws a bunch of crap into his lunch for work because he is to lazy to put carrots, celery, grapes, apple slices, etc. into a separate baggy, men lol. I never thought to just pre-bag it so all he has to do is grab it. Thank you so much for sharing all your wonderful ideas with us aspiring IHeart Organizers! If you haven't checked out Weelicious (or liked on FB) it's a fantastic site. I can certainly get lost browsing however my favorite feature is the daily picture of the school lunches she makes for her young son. Truly healthy and inspirational. I love my laptop lunch container for myself - I may try it for my daughter this year too (I've been a bit worried she'd accidentally throw away the containers and/or tops). It really is so much easier to pack healthy when you eliminate all the pre-packaged chips, snacks, junk. Lovin' your new hair do' and the changes you've been making to the blog too. I have a lunch section in my refrigerator, and portion out the veggies/nuts ahead of time. Most fruits are cut the morning of, though all are pre-washed (by me!). I may implement your idea of a basket, but not sure my fridge has the space. The shelves are laid out weird, and I haven't figured out how to change them! Lunch stations - inspirational. I'm always scrambling together morning tea snacks for my kids. Will definitely use this idea. We used the Easy Lunch Boxes last year and loved them! I also borrowed from the bento idea and bought regular and mini sized silicone cupcake liners to further divide the sections. Lunches look so appealing this way! I also make PB&J for the week and freeze. A cookie cutter makes them into fun shapes. I try to mix it up and keep things interesting. And this weekend, my goal is to gather all the lunch-making goodies and create a basket like this one, so perfect timing on this great post! Thanks! By far thus is the best. I showed this picture to my 16 year old giant lol. He is just tall. He said that would be awesome. So I am off to the store to create a snack bin. Pictures to follow. Thanks for this post! I just made a vow to share all my lunch ideas on my blog, and I'm hoping to find more inspiration like you just shared. I'm heading over to Pinterest now! I absolutely love your lunch station idea. I definitely want to try this. With 3 kids in school and a hubby off to work, I have a lot of lunches to pack. I think this will help streamline our mornings! Thanks for sharing such a great tip! They are made of polyester and can be washed with your dishes or in your machine and can be used pretty much endlessly. This is surely an efficient way to packing lunches for kids. Plus they also enjoy the decorative foods. Totally love this idea. What I'm curious about is how the kids would manage to keep those decorative lunches intact so that they could tell what they were eating. They make an awesome presentation but after being tossed around inside a backpack I can't imagine they would look pretty at all. Our plain PB&J sandwiches look like mush after that. I got a nifty little tool at Walmart made by Wonder. It cuts the crusts off the sandwiches and seals them in a little pocket like those uncrustables. My kids love it and ask all the time for 'hidden' sandwiches. I have a Goodbyn lunch box for my kids but its never been opened. I can't get them to agree to anything besides the typical PB&J. I don't have kids yet but I do pack my hubby's lunch for work (& mine). Not that he expects me too but I figure for all the other household to dos he takes care of I can easily do this for him. So...my habit is making our lunches immediately after dinner each night. I do it as we are cleaning up so it doesn't feel like such a chore later. Plus it's an easy way to pack the leftovers right away. I find that if I wait until the morning I am rushed and that is when we are likely to just say "oh well we will grab lunch out today." Packing saves a ton of money and like you said feels like a treat when it is done on occasion! I love your ideas and system... helpful for once we do have kids! We use LUNCHBOTS boxes,they are metal as we try to avoid plastic also kids konserve tubs for things that will likely leak. Hi Jen, I only found your blog yesterday and today I took some time to read a little. I just wanted to say thank you, because this motivated me so much that I have spent 4 hours of cleaning up my kitchen drawers and cabinets today. Still my kitchen is not as perfectly organized as yours, but it is a beginning. I intend to buy some of those helpful containers that I saw in your pictures and improve it even more. The thing is that I work full-time and with that and my family and a big home, it's really a lot of work. The more helpful it will be to have a place for each little thing, so I might become a better homemaker in the future. Thanks again, I will come back for more inspiration! I'm stealing these prep ideas! I struggle every morning with my 3-yo-old's lunches for preschool. I love the idea of the Bento boxes and not using a zillion baggies, but I'm also very concerned about food safety and keeping everything nice and cold. The Bento boxes I've seen online don't seem to have any place for ice packs, or do they? Please help! Thanks! Also, I know there are the cute, reusable bags you can buy, but those don't seem very sanitary to me. How do you clean them? I love the basket-in-the-fridge idea, I tend to use the concept with dry goods and now I can use the idea with the cool items too. Thanks Jen. Just one of my 3 girls takes lunch (the teen often takes anything, seldom the dried meat package; and for the toddler, one mom at her classroom takes lunch for all of them one week at a time), so usually what I do is just ask my husband when he does the groceries to bring me some goodies and have them available and somewhere hidden, and have chopped fruit ready to go. That basket is a great idea! However, I don't think it would work at my house, because, for some reason, yummy things like that don't last more than one day. LOL the girls would be all over it in a minute. Thanks for the LunchBoxes they seem great, I might give them a try! The author is a photographer in Hudson whose goal is to make healthy and fun lunches for her sons! Thanks for this great idea! I make lunches for my kids the night before, but am often shuffling through the fridge trying to find the right stuff. This will keep it all in one place. Perfect. great post! my problem is that my daughter, who will be going into first grade, only prefers warm meals for lunch. she's not a sandwich gal. she likes rice, pasta, meats, etc. however, what has happened in the past is that no matter how much i warm up her meal in the morning or in what container i place her food in, by lunchtime she says it's cold and smelly! lol so i worry that she doesn't eat b/c of that. but she still insists that this year she wants her warm meals for lunch. ugh..what to do!! Hey Jen, I love this idea, and I wanted to implement it today. However, I'm having trouble finding those cute blue baskets or a good alternative. Where did you find them at? You should look at "lunch boxes with love" they are on facebook and have great ideas and sell stuff too. Great buys fir your aussie fans. Sorry I can't link!on my phone. check out commenter #18, tothemoonandback.blogspot.com. I have not seen cuter lunches!!! I love all these ideas and I pinned a lot of them to my pinterest! I was wondering, can you tell me the dimensions of the blue basket you're using for the lunch stuff? It's such a great idea, and I want to make sure the one I buy fits the fridge as well as yours. Thanks!! P.S. My name is Erin, btw. I had to comment as anonymous because I'm not sure how to do so otherwise. 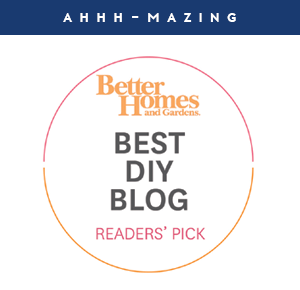 I love your site and it's gotten me fired up to get our house in order. Thanks for the great inspiration! Will these plastic divided containers fit inside a regular lunchbox? Like a previous poster asked (*i didn't see an answer), how do you keep things cold? Slim ice packs are fitting for us with the easylunchboxes, works like a charm! She has great ideas and I just love having more options. Then, I just cut it and laminated it. @Erin - The dimensions for the basket are: 10.5" x 13.5"
I have the Easy Lunch Box containers too and love them! Even my husband thinks they are awesome. Ziploc brand has a bento box as well. I have found them at Target, a set of 2 costs like $3-4. They fit inside a regular $5 lunchbox. No need to spend alot of money on other websites! And Ziploc brand are BPA free and are dishwasher safe!! This is such a great idea for dorm fridge and "pantry" space! Hi Jen, since these are NOT leak proof, when you pack fruits like watermelon, did you notice any leaks or juices running over to other sections of the lunch box? Our lunch boxes are the kind where this box would not be placed upright. Just wanted to clarify before I ordered them. Otherwise they look great and very functional. We don't notice too much. I really strain all liquids prior to using them however. We usually do grapes and chopped fruits or veggies, so they have worked great for us. I love the basket for the fridge idea, but I am thinking about creating several different baskets in different categories like dairy, fruit/ veggie, and whole grain. This way each child can choose one item from each basket and add a Sammie and voila! Lunch! My kids tend to be more excited about food when they feel like they have a part in it. Plus they can pretty much pack the lunch themselves if the prep work is done:) we will see if it actually works. Wow, I love these ideas. Although my children are grown, they both have young school age children, and I'm making up these types of baskets for both my daughter and her three children, and my son and his four children. Thanks so much for the great ideas! Great ideas! I love using (cheap) pencil boxes for "home made kids meals." 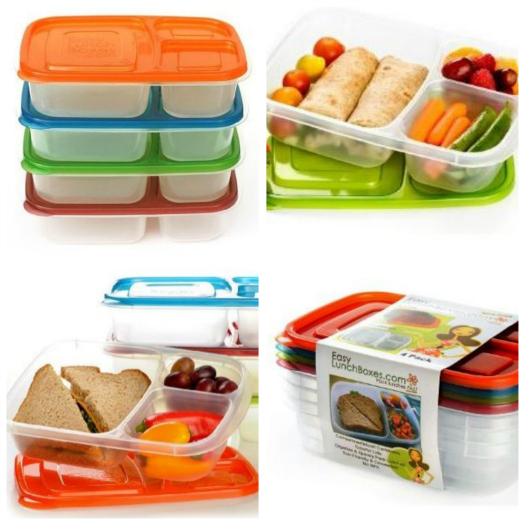 They make great tray-like lunch boxes for in the car and work for anywhere else as well. What did you use to lamintate the tag? A machine? If so which one? I use a GBC laminator that I found at Target or Walmart about 4-5 years ago for around $30. I don't believe they still carry the same model, but they do have some at similar price ranges. I started a "snack/lunch" station for my family. My husband says...Best idea ever!! As soon as I get home from the grocery store, I wash up my grapes & strawberries and package'em up in little snack bags (I do the same for Cheez-it's and other cereal items). This way when my kids come home from school, they grab a snack bag and it TOTALLY saves time in the morning if they want to pack their lunch (as well as for me because I pack my lunch and a lunch for my husband). Easy Breezey!!!! THANK YOU THANK YOU!!! PS.. my co-worker does it for her little 2yr old as well!! gosh when I grow up and have children my goal is to be as cool of a mom as you are! For a very long time now, I've looked for ways to find inspiration to pack my daughter's school lunch and make it a much easier process and a healthier one. 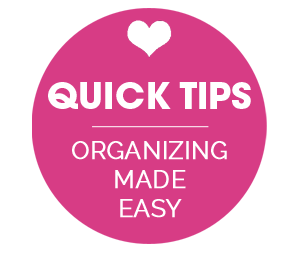 I couldn't have thought of a better way to do so, so I thank you I♥organizing! neeԁed about this subject and didn't know who to ask. I set up a lunch station for the dry goods portion of lunches several years ago but just started with the refrigerated portion this year. I love it! I plan out the lunches on Sunday & portion them out for the week in individual containers. My son has used a "no waste" lunch box since 1st grade. We use Tupperware & Rubbermaid, even his spoon for his applesauce is reused. It's a plastic disposable spoon because I don't want to send my good flatware to school with him but we still wash & reuse it. Over 5 years, we've only managed to lose 3 lids to my Tupperware. I love this no waste, easily packed lunch system. AND I have even managed to teach my son to come home & immediately put the containers in the dishwasher!!! I do a weeks worth of lunches on sunday night and pre pack everything but the sandwich. That way I know that my kids will be getting healthy lunches and not pre packed from the store. Oh My!!! Where has this been all my life, I definitely need this for my fridge, with Hubby and myself working, and one kiddo in kindergarten, Luckily one is only 4 months old so packing for him is easy. I need this so badly, might save us major money, and even give us better healthy choices, only so many times you can do eating out a week at work. Hello everyone! Love these ideas for school lunch! Next week I am moving to another house with my family and I want to make something healthy as a snack. I will take some of these lunch boxes and will fill them with veggies and fruits. I also will make banana smoothies. I am sure that my kids will be glad.